Caviar is the roe or eggs of sturgeon, a species of fish. Roe from another fish, like salmon or capelin, might loosely be called caviar, but in reality, it is not. It is actually a caviar alternative. The best caviar comes from sturgeons in the Caspian Sea, like Beluga, Osetra, and Sevruga. Thus, Russian and Persian caviars are quite reputable. They are also quite pricey. This is not an issue for some people who would pay anything for gourmet caviar. The flavor of roe caviar is usually an acquired taste. Fishy and briny, the delicacy consists mainly of fish eggs and salt. The Russians use light salting to make caviar. In doing so, they produce the famous malossol caviar. The salt enhances flavor, acts as a preservative and prevents freezing. Depending on the different types of caviar, different amounts of salt are required. The best caviar, however, is one that contains little salt-prepared the Russian malossol way. Due to its rather intense flavor and relatively high price, the delicacy is served in small amounts. It is consumed as an appetizer in or as a garnish on side or main dishes. Available in different shades and colors, caviar makes a striking appearance aesthetically. Red caviar, which comes from the sturgeon alternative, salmon, for instance, looks appealing when served, as does black caviar that comes from Beluga, for instance. This delicacy impresses with its looks and taste. Therefore, if you want to keep your guests happy, do it the traditional Russian way with vodka and caviar. 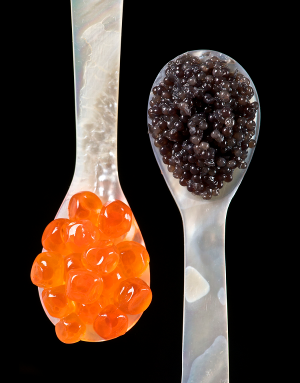 Salmon roe (left) and sturgeon caviar (right) served with mother of pearl caviar spoons to avoid tainting the taste of the caviar. When most people think of caviar, their minds immediately jump to Russian caviar. While Russian caviar is world famous and considered by many people to be the best caviar, the word "caviar" has its etymological roots in the Persian word for egg, khyah. It was not until the 16th century that "caviar" first appeared in the English lexicon. Experts believe that it entered the English language through French and Italian, which had borrowed it from the Turkish language through the word havyar. The caviar delicacy has been imitated, but connoisseurs and loyal fans believe that nothing comes close to the sturgeon caviar that comes from the Caspian and Black Seas. By law, the word "caviar" can only refer to sturgeon eggs. Therefore, varieties that you see on the market, like lumpfish, salmon, and paddlefish, are actually caviar alternatives. Overfishing of sturgeons in the Caspian Sea is a chief reason why these alternatives are dominating the market today.